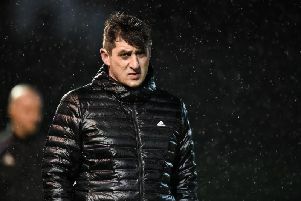 DECLAN Devine defended his passionate celebrations at the end of Friday night's dramatic North West derby, claiming victories don't come much bigger than against one of Derry City's fiercest rivals. 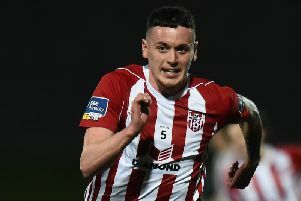 The City boss raced across the pitch to celebrate with the boisterous travelling Derry City support after his side battled to a 3-2 win against 10 man Harps in an action-packed encounter. And when explaining the unrestrained, passionate celebration scenes at the end, the Creggan man claims he would've been in amongst the supporters during the game if he didn't have his managerial duties to perform. "The fans have been great to us," said Devine. "We're all fans ourselves and know what this match means to everybody. "Without passion you're nothing. You need an identity as a football club and ultimately if I wasn't standing in that dugout tonight I would've been over there celebrating with them myself." Devine was appreciative of the large City support on the night and claims the connection between the players and the fans is 'hugely important' to him. Declan Devine celebrates a crucial win at Ballybofey. "We're over the moon. We're just so happy to come here and win. We're respectful of all our opponents but ultimately it's about us and how we go about our jobs. "There's a lot of tired bodies in there tonight. The players have given us everything. "The connection between the players and the fans is hugely important to us. We want our players and our fans to enjoy winning games. And they don't come any bigger than playing Finn Harps. It's a big rivalry and has been for a long period of time. "It's a huge result for us and we're delighted to come out of here with the three points."